Morning Glories are native to Mexico. In the early 1600's they were introduced to monasteries where the monks frequently used them as inspiration for the decorative borders of the manuscripts. 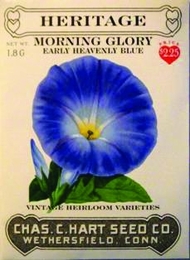 'Heavenly Blue' was first found by a home gardener in the early 1900's and quickly became the most popular morning glory. This heat loving annual vine, twines to over 15 feet with heart shaped leaves and deep sky blue flowers. 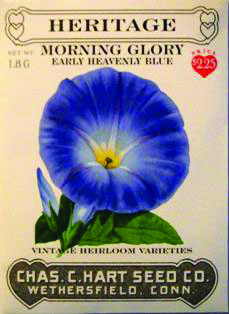 Each morning glory blossom appears in the morning lasting only one day. For best results, do not fertilize. Seeds germinate best if soaked in water for 24 hours before planting. Plant directly outdoors in full sun 4 weeks after last spring frost. Cover seeds with 1/4 inch of fine soil and keep evenly moist until plants are 6 inches tall. Will tolerate dry conditions once established.